The relic selection tends to be night and day based on whether or not the card is a prime parallel or just a regular version. The biggest problem I have with Certified card design is that is nearly indistinguishable from Panini's higher end Limited football. As far as base card go, the shimmer and shine of Certified easily tops products like Prestige, Rookies & Stars, Threads and Epix. As with most Panini products, the only thing that hinders the appearance of autographed cards is the sticker drop autographs. For some reason, Panini's sticker drops tend to look worse than the other Topps or Upper Deck. The checklist is your standard mid-season football checklist, offering plenty of big name rookie autographs and a handful of current stars and legends. The biggest problem I have with early and mid-season checklists is the lack of relic autographs of many of the leagues surprise rookies. It would have been nice to see a LeGarrette Blount Freshman Fabrics autograph and a handful of other breakout rookies. Per usual, Panini's non-auto/relic inserts and parallels are hard to figure out, they lack the continuity and flow needed to be collectible. Due to a reasonable box price of around $90, Certified's value is better than the product itself. Four hits and a host of numbered cards is a decent proposition at the end of the day. Each box delivers 1 Freshman Fabrics rookie auto on average, which feature at worst 2-relic pieces. The one thing I like most about Certified is that it delivers what I believe to be the perfect amount of packs. Ten packs doesn't leave you with an overwhelming amount of junky base cards, while lasting longer than a one pack box. All in all, Certified is a fun product that "is what it is", meaning it's not going to blow you away, yet it's not going to disappoint. 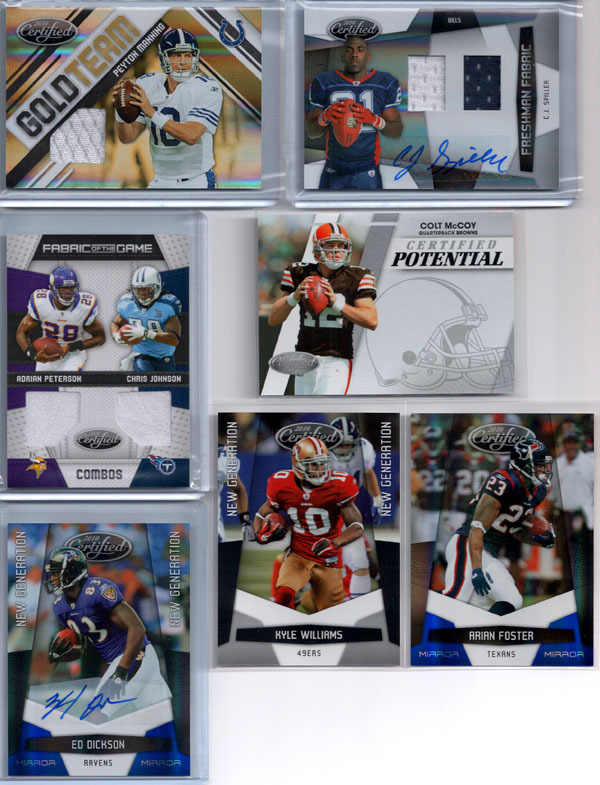 2010 Certified Football is a solid product that cuts straight to the hits and doesn't overload collectors with meaningless base cards (10-packs/4-hits). The relic selection can be inconsistent at times and usually requires the pulling of a prime parallel to obtain an intriguing, hearty patch card. Overall, Certified is a solid, serviceable football card offering that won't "wow" you, but at the same time won't leave you with an overwhelming case of buyer's remorse. I would recommend it ahead of products like Prestige, Threads and Rookies & Stars.